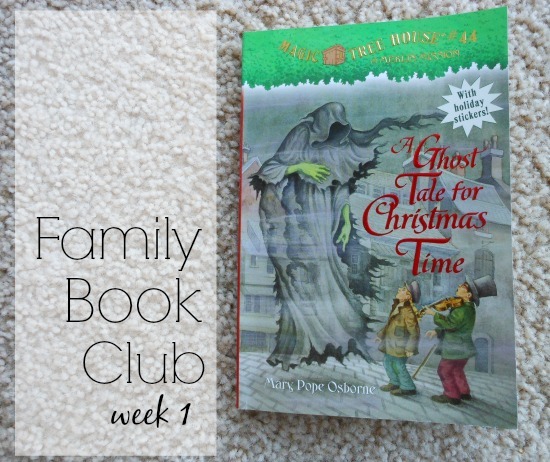 For the second Family Book Club we’re reading A Ghost Tale for Christmas Time . This is an affiliate link but as always, I recommend you try your local library first. Every week I will post a new reading assignment along with some discussion questions or activities that match what we’ve been reading. If you need help remembering when to check-in, I will share the posts on Facebook and through my Newsletter. At our house the kids are close in age (9 and 7) but I know that’s not true for a lot of you. I try to mix the discussion questions with some for younger kids and some for older kids. I recommend you simplify any questions that you feel need to be or expand on questions as you’re chatting away. Use whichever questions you think will interest your kids and skip the ones you don’t want to ask. Let these questions be a guide, don’t be afraid to change them up or come up with your own questions. There are no right answers and the idea is to get your family talking. Mary Pope Osborne uses the prologue to catch readers up on what’s happening with Jack and Annie. You do not need to read these books in order to enjoy them. If you have not read the adventures mentioned in the prologue, talk about which ones sound exciting. This is a great way to expand your “must read list”. If you have read the books that are mentioned, take this opportunity to talk about what happened in the book. What were your favorite parts? What surprised you? Do you think any of the adventures in this book with be similar to the ones in the previous books? There is a lot of talk in chapter 2 about how Annie has to pretend to be a boy in order to wear clothes that she thinks are comfortable. Would you feel comfortable in fancy clothes? What if wearing dresses (or a suit) were the clothes you had to do everything in? Would you like to play, run or do chores dressed that way? (This was interesting for us because when Little M was in preschool she only wore fancy dresses…. now she only wears stretch leggings.) What a great conversation about what is comfortable and how different it can be for different people. On page 13 Annie says “In the past, girls didn’t have many choices, did they?” Open that up to a discussion about what that means. How would they feel if girls weren’t able to make as many choices as boys now. Dive in as far as your kids want to go. Maybe even do a little research about the difference between boys and girls in Victorian times. 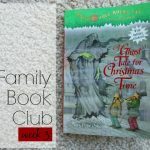 At the very end of the chapter they hear a mother call her son Charley Dickens. That could mean a few different things. Make predictions about who this little boy is. Do your kids love math? Mine do. Big M was quickly doing the math in his head along with Annie. Little M grabbed a piece of paper and wrote it out. On page 25 Annie starts to form a plan. Before you hear what it is, talk about what she might be thinking. What would you do if you were in their place and needed to speak to Mr. Dickens? Jack and Annie did not succeed in speaking to Charles Dickens. What do you think about the way they handled the situation? Can you think of other ways they could meet him? Check in through the week. Leave ideas and discussion questions of your own in the comment section. Or just let us know you are reading along! Happy reading. In chapter 3, we talked about what it means to go from riches to rags or rags to riches. I love that! Thanks for sharing.